Born in 931 in Burgundy, France as the daughter of King Rudolph II of Burgundy, Adelaide was promised in marriage when she was only two years old, to a man named Lothaire, the son and heir of his enemy, Hugh of Provence. Lothaire was killed when still young, and Adelaide was to have a tumultuous life that paralleled the struggle for political power of the times, something she had come to symbolize. Having been sought after by various kings and nobles after Lothaire’s death, she was finally married by Otho the Great of Germany, who had invaded Italy. When Adelaide and Otho’s son, the Emperor Otho II died, his son Otho III, only a child at the time, became emperor. 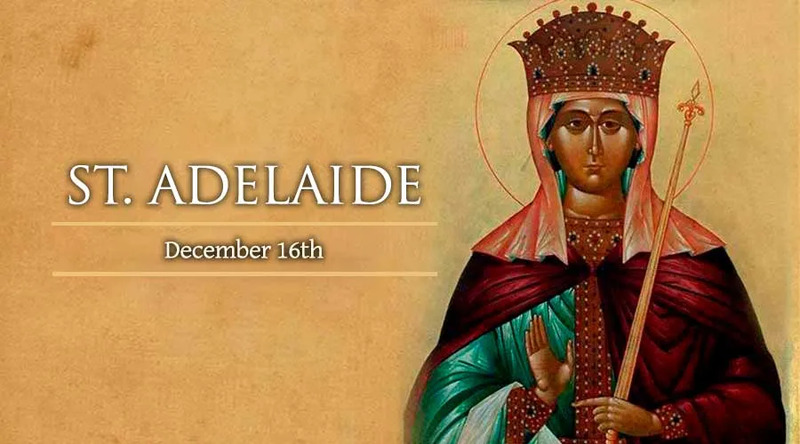 In 991, Adelaide was invested as the Regent of the Empire, and she used her power as the effective empress to increase evangelization efforts, especially in northern Europe, and built many monasteries and churches, and also gave much aid the poor. She died in 999 at the monastery of Seltz, Alsace, and was canonized in 1097 by Pope Urban II.